The Peoples Democratic Party on Tuesday accused the Independent National Electoral Commission of colluding with the All Progressives Congress to win the February 23 Presidential and National Assembly elections. This, the PDP said, was done through the militarization of polls in its strongholds and skewing the process in the favour of the ruling party. This was contained in a letter the National Chairman of the PDP, Uche Secondus, handed over to INEC management during a peaceful protest it organised to express its grievances about the February polls to the electoral umpire. The protesters had marched from the PDP complex in Maitama, Abuja popularly called Legacy House to INEC headquarters. He urged the INEC Chairman, Prof. Mahmoud Yakubu, to make a statement that the military must not come near where elections would be taking place on Saturday. A copy of the letter signed by Secondus and addressed to the INEC chairman, titled, ‘Cases of infractions and deliberate violations of the electoral law and guidelines,’ was made available to our correspondents. Secondus said the letter became imperative as the nation approached the governorship and State Houses of Assembly elections on March 9. The letter partly read, “We observed with regrets that the usage of the SCR machines was enforced strategically in the South-South, South-East and the North-Central zones of the country which are essentially the PDP strongholds. This is radically different from what transpired in the North-West, North-East and the South-West, which were estimated as the APC strongholds. “The deliberate non-deployment of the Electronic Collation System (E-Collation) for the elections results from the units, through the ward centres to the Presidential Collation Centre in Abuja as provided for in the 2019 Electoral Regulations and Guidelines made by you, and as contained in your several official press statements is very suspect. “This is more so when you have never bothered to explain to Nigerians the justification for this sudden official somersault on such a critical component of the electoral process especially with all the taxpayer’s money spent to install the facilities. He added, “We also want to bring to your knowledge that most of the collation centres in the country were cordoned off by officers and men of the armed forces who chased away accredited agents and or candidates of our party, the PDP, from such centres while the results of the elections from the units were being manipulated, mutilated and altered to suite the dictates and criminal desires of the APC led government. These results that were tampered with were accepted by you and your commission and announced as the results of the elections. He said, “We have taken time to chronicle the above fundamental deliberate violations and infractions of the Electoral Law, Regulations and Guidelines and all known canons of electoral best practices by your commission in obvious complicity and collaboration with the APC and security agencies to rig the elections and rob our party of victory. Secondus also cautioned INEC against militarising the electoral process, adding that such was undemocratic. Secondus later handed over the protest letter to one of Yakubu’s representatives who received the protesters. INEC National Commissioner, Legal, May Agbamuche-Mbu, who spoke on behalf of Yakubu, while addressing the protesters, commended them for approaching the issues in a civilised manner, adding that the commission had received the PDP’s complaints. She said INEC members were employed to do a professional job but added that they could not do the work alone. Agbamuche-Mbu said, “We are going to look at it critically, where we need to change, we will change, where it concerns others, we will come together and work together. This country belongs to all of us and we must protect it with all our might. I believe that on Saturday, the elections will go on very well but our mantra in this election is that we want peace in our country. “I supervised elections in Rivers and Bayelsa states so I know what it means to invest in that area, and the people of Rivers and Akwa Ibom states know what they want. 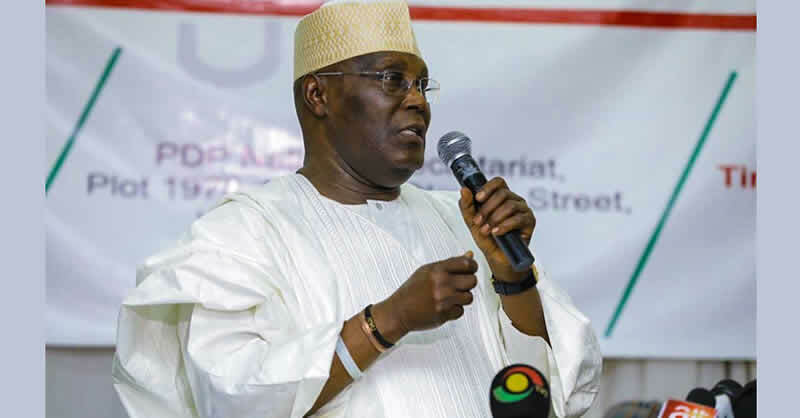 Meanwhile, the PDP and its presidential candidate, Alhaji Atiku Abubakar, on Tuesday, filed an application seeking an order compelling INEC to allow them to inspect materials used for the conduct of the presidential poll. The petitioners, through their lawyers, Chief Chris Uche (SAN), filed the ex parte application before the Presidential Election Petitions Tribunal located on the premises of the Abuja Division of the Court of Appeal. They are through their application seeking the tribunal’s order permitting them to inspect the Voter Register, the Smart Card Reader Machines, ballot papers and other documents used for the conduct of the polls. The petitioners’ application filed ex parte would be heard by the tribunal in the absence of the respondents.